Designed with an extra-strong seal - These bags keep food fresh with patented MaxLock track that clicks to let you know it's securely closed. Easily open and close these bags - Unique slider design offers one simple sliding motion. Label and organize the contents of each bag in your fridge, freezer or closet with large write-on labels. Prepare ingredients for large holiday meals or treats ahead of time, keeping them fresh in these slider bags until you're ready to use them. Send treats and leftovers to go with friends and family. 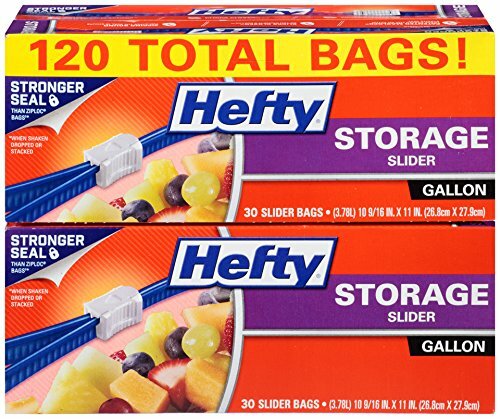 This pack includes four cartons of 30 Hefty-gallon Slider Storage Bags (120 bags total) that are BPA free with a 100% satisfaction guarantee, and are available in both quart and-gallon sizes.